Well, “ugly” is prejudicial. Unexpectedly fierce? Appallingly vicious? 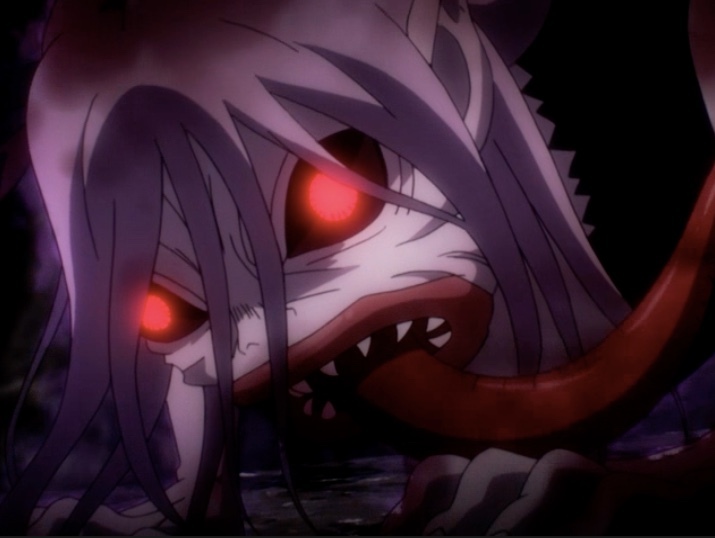 I’m struggling to describe how Shalltear Bloodfallen looked to me when she went into full bottle mode in True Vampire, the latest episode of Overlord on FUNimation (or here for information if you’re not a subscriber). Last week’s episode (review here) ended on a shock: Albedo announced that the vampire Shalltear, one of Ainz Ooal Gown’s loyal servants, had turned traitor. This episode starts with a flashback. Sebas Tian and Solution Epsilon, a Pleaides Battle Maid, are on an expedition along with Shalltear to find warriors with promising martial arts to bring back to Nazarick, their base of operations. I thought the episode did a great job building suspense: when was Shalltear going to show signs of rebellion? The narrative really drew me in: I was on edge from the first second! Shalltear showed no signs of rebellion here! Capture from FUNimation’s stream. Shelter makes her appearance in a stagecoach with her Vampire Wives, Sebas, and Solution. She showed no signs of treason: she spoke of her desire, even enthusiasm, to fulfill her mission for her lord. She even seemed happy to share her recollection of conversations with the “supreme beings”, which included Ainz and his friends, with Sebas. Would something happen to her in the scuffle around the stagecoach, where ruffians thought they were about to rob helpless rich folks? 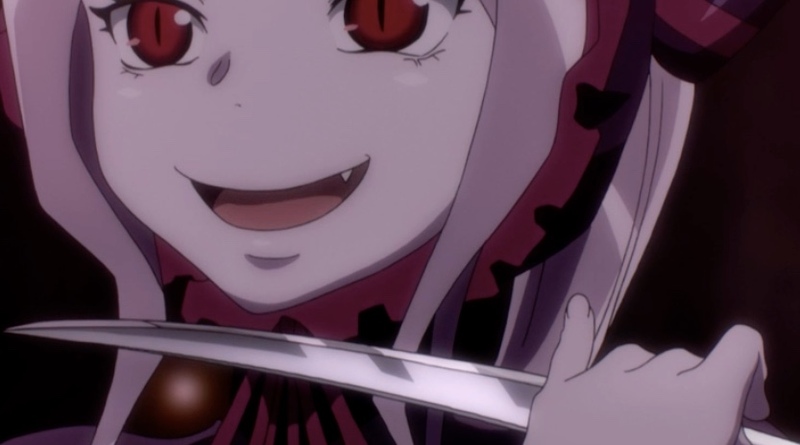 Nope — Shalltear was her usual happy self as she ordered her Vampire Wives to slaughter everyone in sight. After the battle, the Vampire Wives found evidence of Brain, a supposedly powerful human that might match the criteria for their search. Before leaving to investigate him, Sebas and Solution left. Would Shalltear show her true colors now? Nope. She stayed on mission. I thought that maybe Brain would give her a challenge, maybe upset her enough to reconsider her dedication to Ainz — but no. He turned out not to be even an annoyance. And I have to say: I love Shalltear’s voice! She sounded so innocent and ernest when she told Brain that she didn’t mind if he called all of his friends to help him. Kudos to the voice actor, Sumire Uesaka. Even in her disappointment, she still tried to console him by telling him he could still be of use to her lord. So, still no clue that anything was amiss! As Brain ran away to hide behind the line of his defenders, Shalltear decided to change into her battle mode. And, wow, is that a change! I thought that maybe, in this “mode,” she’d be more susceptible to suggestion — or some kind of magical or other attack. But no, she blew through Brain’s defenders like they weren’t even there. Would she fall into some kind of emotional turmoil when she found Brain had escaped through a tunnel? Nope — she was just frustrated, but still loyal, Shalltear. One of her Vampire Brides interrupted to say a party approached. When lamprey-version Shalltear met them, she said, “I have to capture them, but I want to kill them!” Would that tension cause her to question her allegiance? Again, nope! She killed all of them except one. One who threw a red portion that managed to burn her even in her lamprey state. Turns out that was a potion that Ainz had created, and Shalltear recognized it. I wondered if this was the turning point — would she be angry that Ainz would “interfere” with her sport? Would the portion have some kind of affect on her? Or cause her to doubt his dedication to her? Wow. She is positively terrifying. Captured from FUNimation’s stream. But no! Shalltear correctly deduced that Ainz must have been near here building his reputation, and she wondered what she could do to not damage his progress! She captured the woman alive an interrogated her to find out that the party that was otherwise deceased had stationed a ranger far enough away to report back to E-Rantel for backup. Even now, Shalltear’s reaction was dismay that Ainz would “scold” her. This did not seem like the reaction of a traitor! At this point, we’re almost 20 minutes into the episode. I’m still on the edge of my seat wondering when Shalltear’s going to rebel. To me, this is what writing should do: pull me into the story and not let me go. But to finish strong, the story has to answer the question that it asked at the end of the last episode: why did she rebel? Was the answer interesting? Or a let-down? When Shalltear realized that someone got away and headed for E-Rantel, she found that there was another party nearby, one that wasn’t such a push-over. It was a larger party, better equipped, and better disciplined than the ones she’d encountered so far. Their routine magics and weapons were no match for her. But there was some other attack, something we’ve not seen before, that hit her hard. It was something that looked like a dragon. She slew the caster, but not before she had been hit. Whatever the weapon was, its effect was to cause her registry in the game status viewer that Albedo and Ainz used to show that Shalltear was no longer an ally. Back in Nazarick, Ainz ponders what could have happened as Albedo tries to give him battle counsel. His insight is that there are skills and powers that weren’t in the original game; he’s worried that those who had been non player characters (NPCs) like Shalltear and Albedo might be at risk from whatever hit Shalltear. Albedo is all for launching an attack, especially given how powerful Shalltear is. One of the things that impressed me about this episode is how Ainz worried that maybe she rebelled (if she did rebel; he’s not convinced) because he didn’t treat her well enough. I love characters who are self-aware enough to understand their failings and who are willing to explore those failings. 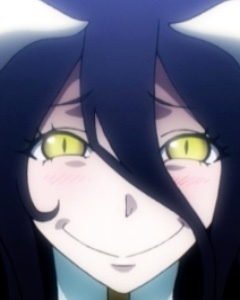 Albedo is just so open about her feelings. I like that about her character. Capture from FUNimation’s stream. He muses out loud that he can’t risk her and the others until he knows more; he loves all of his NPCs because he and his friends had created them and had established all of their personalities. They were the product of his friends’ hearts and dreams; they were his link to his friends who were now in another world. You can probably guess how Albedo reacted to the word “love!” I really enjoy her character! She’s so powerful, and at the same time, so dedicated to Ainz. He know it’s because he messed with her configuration just before the event that trapped him in the game. Yet, he still seemed dedicated to her and the other NPCs. And she has a great smile! But what about Shalltear? What happened to her? When se last see her, she’s standing bent over, motionless, with almost no expression on her face. So in a sense, we ended this episode where we ended the last one: with the unanswered question of what happened to Shalltear. However, we now understand the scope of this question, and we understand the stakes, which are nothing less than the safety and loyalty of all of Nazarick’s NPCs. This series continues to keep my attention. I can’t wait for the next episode! That’s the sign of a compelling and interesting series.